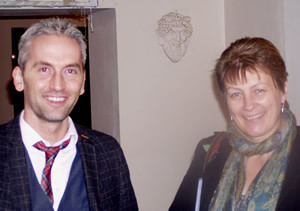 I was delighted and honoured to represent Coventry, alongside fellow poet Janet Smith, as part of the Twin City Poetry Exchange 2012. 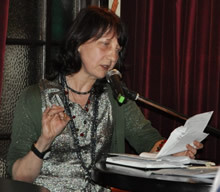 There were many highlights over the five days, not least among them our guest readings in Cork and Limerick. It was a pleasure to meet and talk with other poets, hear work in a range of styles via the open mic, including responses to the Five Word Challenge. 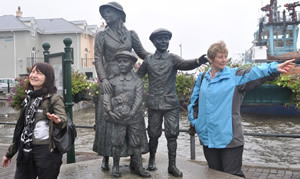 Visits to Grange Stone Circle and Cobh; good conversation in fine company; home-cooked food and much more. All this, together with time to explore the sights of Cork under our own steam, have enriched my writing experience, inspiring new work. 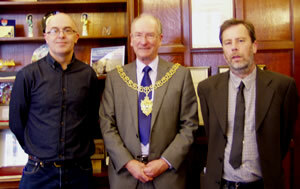 I hope that Cork poets, Conor McManus and Matthew Geden, found their recent trip to Coventry equally inspirational. It was wonderful to meet them both and talk at length about life and writing, and to hear their guest readings at Nightblue Fruits in Coventry and The Fizz in Tamworth. 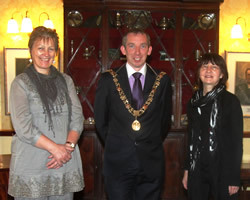 Sincere thanks to Paul Casey for his excellent hosting, behind-the-scenes hard work and organisation; to The Right Honourable John Buttimer, Lord Mayor of Cork, for his warm welcome and patronage; to Finbarr and Marion at our home-away-from-home B&B. It has become almost hackneyed to say it, but the past, as LP Hartley stated, really is a foreign country. In fact, for me, going on the Cork-Coventry exchange was both a jaunt through time and space as I lived in Coventry until I was sixteen though I’ve spent most of my adult years in Kinsale just down the road from the city of Cork. I was curious to see what had become of my childhood haunt and what writers might inhabit the night-time readings of a city that was foreign to me now. Conor McManus and I arrived with just enough time to refresh and eat before we met Antony Owen, poet and co-host of the Night Blue Fruit monthly poetry reading. Antony, the best-dressed poet I’ve ever met, kept up an entertaining monologue as he drove us out to the canal basin where Taylor John’s House, the venue, was located. The bar had the air of a large cellar with a sprawling events room which included a stage, pianos and various materials draped artistically from the ceiling. The lighting was low and multi-coloured giving a relaxed and convivial atmosphere. 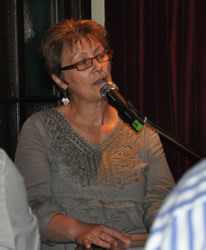 I was impressed with the clarity and sincerity of the open-mic poets. These writers have serious intentions and engage with hot topics such as war, feminism, race and abuse. Poetry here seems to have retained a political edge and each poem moves towards some sort of hope for change or catharsis. The Lord Mayor of Coventry attended and gave Conor and myself a warm welcome and throughout we were treated rather like exotic animals from a far-off land. Our words, seemingly more personal, must have appeared like loose translations from a different language or notes from another time. 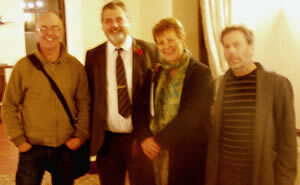 The following night Antony whisked us off to Tamworth for another reading, this time organised by Malcolm Dewhirst. Mal had, however, suffered a recent heart attack and so the evening was hosted by Antony. The venue was a beautiful old gate lodge which had a rich and varied history evident in the creaking stairs, sagging ceilings and ghostly presences that slipped between rooms. This time I got to hear Antony’s poems. His recent work draws upon war and the language is as tightly packed as a home-made bomb. 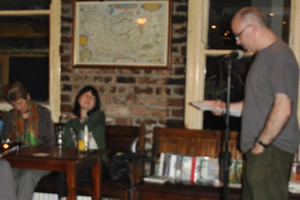 Conor read some fine work including a long prose piece and Jon Morley, a host of the previous night, launched into poems that were energetic mini performances in their own right. Other highlights of our visit included a memorable reception in the Lord Mayor’s office, he surprised us both by producing unusual literary efforts from his own past. We were also made most welcome as guests on Kate Hills’ radio show on Hillz FM. Kate interspersed interviews of the two of us with cool, funky music and the hour sped painlessly by. I saw Coventry in a new light, a city struggling to shake off a bombed-out centre, poor urban planning, factory closures and high unemployment. The warmth of the people made me realise that the city is much more than just a cluster of buildings and that cultural exchanges such as this create bonds and friendships that allow us to escape our past and forge a bright new future. As the date approached I was getting emails about flight reservations, hotel bookings and seriously cold feet. I had to get a grip and take this in hand. 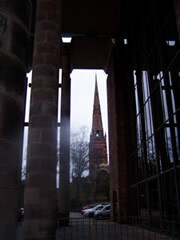 I had never been to Coventry and knew nothing about nobody. I’m thinking, ‘Tony Owens, who is this guy’. He could be a ‘serial’ something or other. 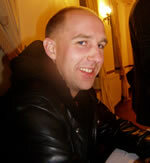 Even Matthew Geden whom I was signed up to travel with who was he? The first thing I did was Google G-i-d-e-n. Night after night I stayed up bleary-eyed trying to find this guy, I googled, twittered and tweeted and nada, zippo, zilch, and thought, I’m dumped in it rightly now. I’m travelling with some nobody. Then I changed the ‘I’ to ‘e’ and there he was in a flash beside a poem to Saint Bridget. And a damn fine poem too. Though I won’t be telling him that. So my mind was at ease and on the day in question, the day of the flight. I packed passport, tickets, money, socks and toothbrush and of course my reading material; fed the goldfish; put my daughter and dog in the car; dropped the dog off at the other half’s chez and continued on to the school. I was under a little pressure so I just parked in the disabled parking slot conveniently placed near the school entrance. It’s ideal and always available. But when I came back out the car wouldn’t start. Now, my car has never before not started. The fathers standing round the school gate and the schoolmarm looking out the window. Bad Karma or what? I was sweating bullets as I turned the ignition and pumped the accelerator – the fear of flooding her at the back of my mind. It’s a delicate balance. Not only would I be late for my Nightblue Fruit reading but the car would be abandoned on top of a ‘wheelchair’ symbol. Finally, it started and I thanked the universe. Nightblue Fruit awaited. On the way to the airport, mention of my county of origin stirred up memories for my mid-sixties taxi man. He was ridin,’ (his words not mine) simultaneously until he was rumbled, two Kiltyclogher girls in San Francisco forty years ago. They were friends. Nurses. On opposite shifts. Ideal scenario. Until one spilled the beans. He got sentimental. Lovely girls, he said. Was disappointed that neither of them had ever tried to contact him since. Mmmm….Maybe time isn’t such a great healer, I thought. Finally, hooked up with Matthew Geden and reached the home of the Specials, Philip Larkin and Massey Ferguson tractors without further glitches. At Nightblue Fruit. Jon Morley, a lithe linguistic acrobat was in charge of the mic and there was the mayor, his wife and his chauffeur; the Coventry – Irish contingent; a murder of poets from Birmingham including spoken word man Shabz giving it loads about world hunger and some familiar faces like Janet Smith and Jayne Stanton. Walking into a venue in a city I’d never set foot in before and meeting Janet and Jayne again was part of the magic of twinning. Belfast starved of a son. and I was feeling at home and thinking free speech is a live and kicking in dear Ol’ Blighty. After discussing prose, poetry, and political jewellery into the wee hours I was awoken the next day out of a hangover by the mobile vibrating itself off of the bedside locker. It was my good wife – the dog had escaped from her gaff and made her way back to my gaff. Noël, a concerned neighbour, it transpires, took her in; pampered her and let her sleep on the couch with the light on! So she wouldn’t be afraid! Bad habits I’m still suffering from. And when I didn’t show after 24 hours Noel called the cops who bust in my door expecting to find me sitting up in bed covered in bluebottles. Bet they were disappointed ‘cos I was, as stated earlier, in Cov. The other half had to wait for the locksmith and while on the phone, she was of course singing the praises of Noel whom I’d never met. Don’t even know what he looks like. Works nights. On the docks. Security. She had pumped that info out of him in the space of how many minutes. I could picture it – he was the sensitive docker type. I’m listening and reading between the lines. He had a real job. Not off gallivanting reading poetry. I thought, if Noel is that good at security, let him look after the house. I hung up and went for the ritualistic ‘big English fry –up’ in the Italian with Matthew to rebalance the electrolytes. Two rashers, two sausages, one egg, toast, beans and mushrooms and one coffee, seven squid. Not bad. Please and thank you. 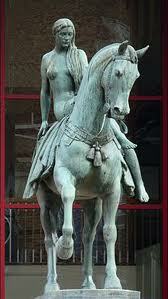 Coventry is the hometown of Lady Godiva and as it happens it was Matthews’s hometown, his old stomping ground. ‘Heimat’ as the Germans would say. Where his heart and lungs are. And he was getting a buzz running round the place. I’m serious, literally up doing seven-mile jogs that didn’t knock a gickes out of him. Over the sausages and slow coffees we talked about Philip Larkin, the Specials, Ghost town, and Hobgoblin, Matt’s favourite real ale. And, sipping coffee, I became pensive, and thought this is rock and roll. Goodwill ambassadors. 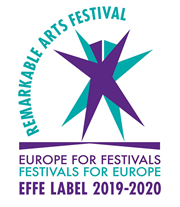 Building bonds between cities and peoples, making friends, developing relationships.’ Where the nation state has failed it has fallen back, as usual, on the most basic building block of society, that is, the relationships between peoples, between individuals. Fallen back on basic human interaction between two or more people to promote openness and tolerance of other. And what better place to be but Cov the City of Peace. What a high ideal? What an aspiration for any city to attach itself too. For four days me and Matt would be the thumb in the dam of the nation-state. What a road trip to be on. Kerouac and Cassady. Buzzed up we went to see the mayor. And on the prompting of Tony Owens we tried to extricate whiskey from the crystal cabinet in the oak panelled chambers of Mayor Tim Sawdon but he wasn’t having any of if. But he blind-sided us by disclosing that he himself was a closet poet, said he had been stirred to dig out some of his stuff for our visit. He certainly was a rhymer and had a flair and a lust for the bawdy ballad, and this is great for Coventry poetry but probably better for politics. Besides the fact that the reputable Tamworth wenches were thin on the ground, the trip went well. Everything ran like clockwork. Well, almost everything. The only weak link in the whole thing was Jon Morley, who stood us up on the steps of the Peace Cathedral with some lame excuse or other. But all was not lost. We headed for Hobgoblin in the nook of the cruck frame Windmill Tavern, with protruding trunnels, on Spon Street. But the next time Mister Morley comes to Cork I’m going to volunteer to show him around.